Bangladesh Military Engineer Services Job circular 2019 will be publish. The authority of Bangladesh Military Engineer Services has been announce a job opportunities for Bangladeshi people. In this circular they are requiting 89 vacancy. Bangladesh Military Engineer Services Job circular 2019. Military Engineer Services has been decided requiting some people in different position. Here you found all kinds of information about this job. In this circular available post are Assistant Executive Engineer (B/R), Assistant Executive Engineer (E/M), Assistant Engineer, Assistant Engineer (Architect), Sub-Assistant Engineer etc. Company Name: Military Engineer Services. 25 to 40 years for the post of Assistant Executive Engineer (B/R and E/M). 20 to 30 years for the post of Assistant Engineer (B/R, E/M & Architect). 20 to 30 years for the post of Sub-Assistant Engineer (B/R & E/M). They are official server are face in trouble. Please try sometimes later. Interested and eligible candidates can apply via online. If you want apply this job then go to their official website or clink apply now link from our website. You must be pay application fee within 72 hours after submission your application form. You must be upload your Photo and Signature on your application Form. Your color photo size 300*300 pixel and file size not more than 100 KB. Your signature size 300*80 pixel and file size not more than 60 KB. After input your all information in application form you must be check it before your submit. You must be save a applicant Copy for further required. A user ID will be provide there. After submit your application you have to pay your application fee by teletalk mobile. Application fee is 500TK. If you want to paid your application form by your tele talk mobile phone then go to write massage option on your phone and simply type. 1st SMS: mes<space>User ID and send it 16222. Examples: mes RYEIWYR send 16222. After sending 1st SMS they are provide a PIN number by reply SMS. 2nd SMS: mes<space>Yes<space<PIN Number and send 16222. When you send 2nd SMS you will received a reply SMS by teletalk. In this SMS they are inform you your application has been successfully completed and provide a Password. Save this password, it will be required to download admit card. mes<space>Help<space>User<space>User ID and send it 16222.
mes<space>Help<space>PIN<space>PIN No and send to 16222. If you need more information then see job circular or visit their official website. If you face trouble to read this post then see whole circular. The circular is given below. We are publish all kinds of information about this job. The authority at first announced written exam date and time then we are update here that. So, you can found all kinds of information in this site. 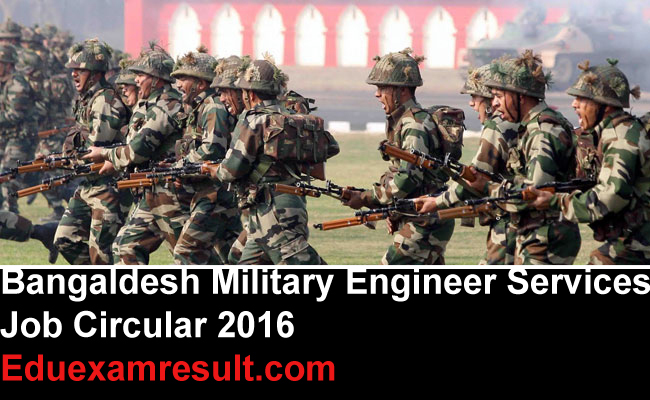 We are also published Bangladesh Military Engineer Services Job circular 2016 mes.org.bd job exam result. At this time they are busy to submit application Form. After application dead over the authority of Military Engineer Services published job exam date. You can download your admit card from our site. So, you need not go another website for any information. After written exam passed the candidates have to face viva vice exam. They are inform you viva exam date and time. You can also see your viva exam date and result from our site.